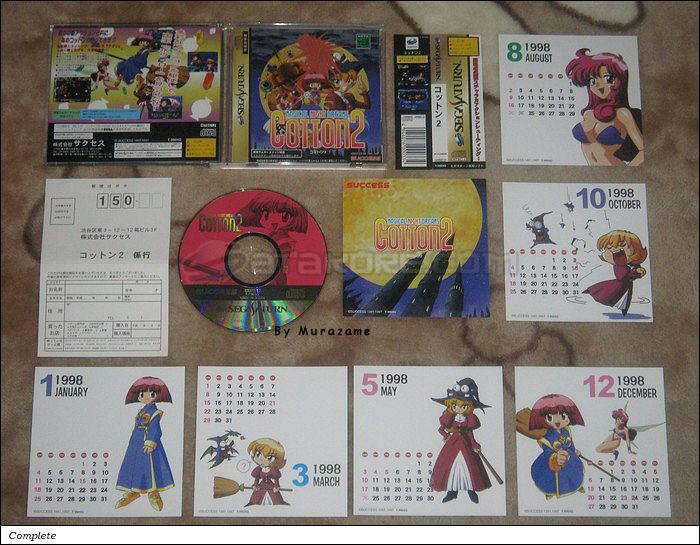 Cotton 2 (コットン　２) is a Shoot-em-up game, developed and published by Success, which was released in Japan in 1997 for the Sega Saturn. Success really peaked with this release and hasn't come close since. Their horrid offering of Rainbow Cotton on the Dreamcast pretty much assured the planet that this series was all but dead which is very unfortunate because Cotton 2 is brilliant in every way. There are a few shmups that are absolutely perfect and this is one. The color pallet is vivid yet not an overblown pastels affair which a lot of Japanese games suffer from. There's a point where cute turns into sickening and then just plain obnoxious, but thankfully this never happens at any point in Cotton 2. The levels are very well laid out leaving you with a wide variety of attack directions and options. The weapons system is also fantastic with a nice selection of powerups throughout as well as the proverbial end-all weapons which do some serious damage. Cotton 2 also offers a nice chain system that leaves the gamer with the option of building multiple chains for massive damage and serious scoring. The bosses are anywhere from moderate to difficult, and all require some thought and planning as well as skill to defeat. The gamer is also offered a small break at the end of each level when it's TEA TIME!, and you get to catch and shoot the teabags that fall from the sky. Cotton 2 also has the option of utilizing a 1MB/4MB expansion upgrade via the cartridge port on the Saturn for extra eye-candy during the game. This is really something to behold on a nice tv with the Saturn's s-video cable. Success really did a fantastic job with this title and it's a shame that the fun had to die on the Saturn. At least they gave us Cotton Boomerang as well!